I saw an Atron within a plex that I wanted to destroy, and apparently the Breacher had the exact same idea that I did at the exact same time. I had never fought a Breacher before, and I only had a vague notion of a 'kitey' light-missile frigate, similar to a condor. That turned out to be completely wrong, and he was a straight-up rocket brawler (from post-fight killboard searching, most Breachers seem to be rocket brawlers. Live and learn). About 3 seconds into the fight, I realized my first mistake: Breachers get a bonus to explosive damage, and I neglected to fit an anti-explosive rig on my Incursus. This wasn't a case of simple negligence, I had actually thought about this and I consciously made the decision to go with a trimark instead of an anti-explosive pump. I believe now that this is a bad idea. Although increasing explosive resistance is useless in most of my fights, neglecting the rig means that I would now have to completely avoid fights against breachers, rifters, kestrel pilots who are smart enough to carry nova rockets, firetails, thrashers, and talwars. I would also have to pray that Tristan pilots throw hobgoblins at me instead of warriors. It just doesn't make much sense to limit what I can engage; it's already hard enough to find a good fight as it is. What I should have done was to manually move directly away from him. Even though I was webbed, moving at 40% of my maximum velocity would have reduced incoming DPS by ~15-20% if he were using nova rage rockets (which I believe he was). How do I know this? 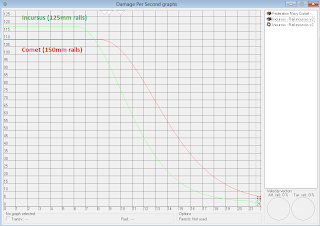 I recently discovered the dps chart feature in EFT, which is an AMAZINGLY useful tool. As an example, I'll show why orbiting the breacher would have been a bad idea. 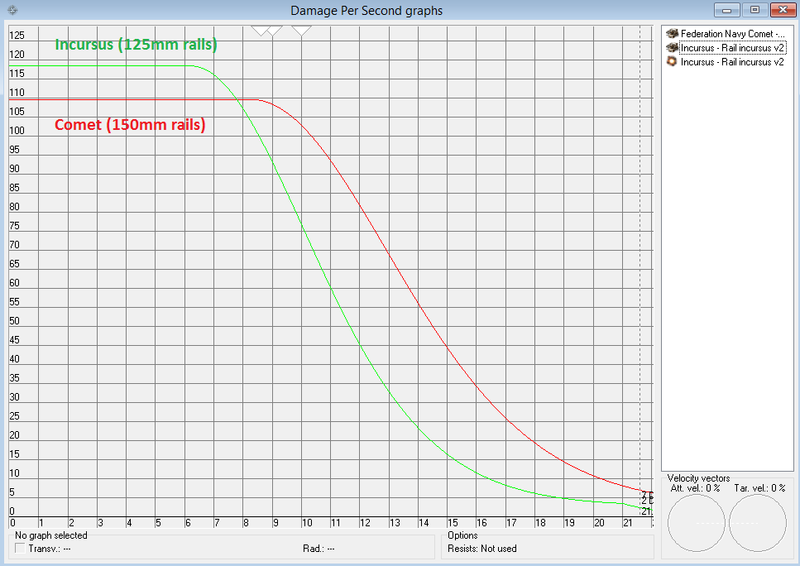 Below is a chart showing dps vs. range, with both the attacking and targetted ship stationary. 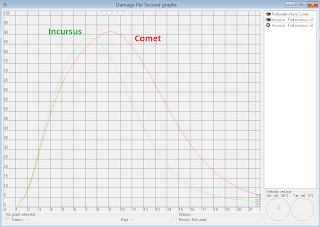 Just for fun, I included my Incursus fit, plus an similar Comet fit (which is a tracking-bonused hull). Below this is the same chart, shown with the attacking ship orbiting the target at its webbed velocity. You can easily see that the tracking penalty negates any benefit to incoming dps that I would have gained. 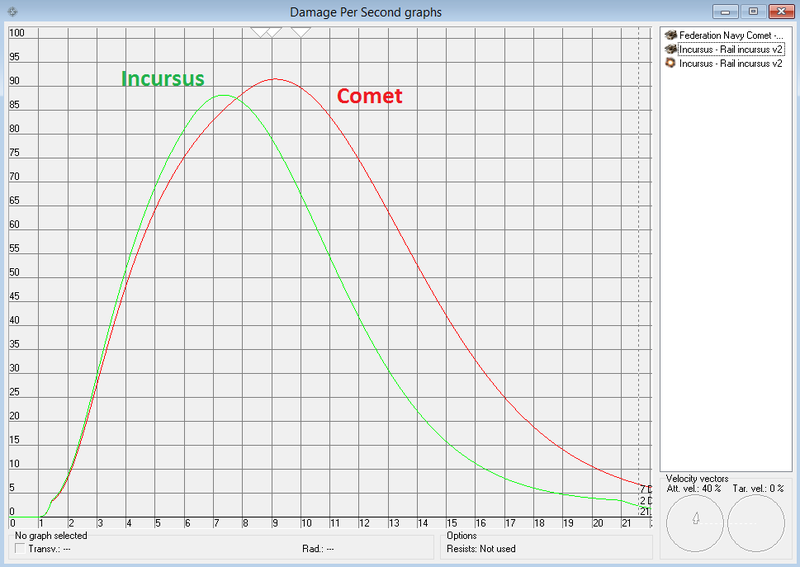 The Comet fares better than the Incursus, but it's still clear that orbiting is a bad idea. I have learned a ton from this tool. You can see what range & velocity you need to get under a cruiser's guns, you can see how your ammo selection affects dps in specific circumstances, and perhaps most importantly, you can see why mashing the "orbit at 500" button is never, EVER a good idea.